A shrimp is a small crustaceans living at the bottom of oceans and lakes that eats both small plants and small animals. In the food world, confusion enters over the various terms used to name them, such as shrimp, prawn, and scampi. British terminology used to use all the above terms and be very clear on the differences between them, while in North America the generic term of “shrimp” was the only one used. With the advent of the Internet, the North American restaurant trade began picking up the words “prawn” and “scampi” from British writers, while confusing what they actually meant. And the previous clarity in Britain is getting confused as restaurant terms bounce back and forth across the Atlantic and everyone in the business tries to keep up with the latest marketable food trends. Some market people and stores on both sides of the Atlantic are now sticking “scampi” signs on raw shrimp. In North America north of the Mason-Dixon line, most people won’t have ever heard the word prawn, though it is sometimes used to restaurants to mean a large shrimp. In the Southern States, it is used to distinguish any size of freshwater shrimp from seawater shrimp. In North America, shrimp is a generic word and is the most often used word to mean shrimp. Period. Any size. Freshwater or saltwater. In the Southern United States, producers of freshwater shrimp are encouraging them to be called “freshwater prawns.” Malaysian cooking has long been known for use of Malaysian prawns, which are also freshwater. Some more scientific folk maintain that prawns are in fact a different species. Foodwise, the freshwater prawns have far less cholesterol and fat (containing less than .5% fat, and that is unsaturated), and their texture is a bit more like lobster. A small percentage of the very small shrimp caught are canned or frozen as “Cocktail Shrimp”; the rest are processed and sold as shrimp paste or potted shrimp. Larger shrimp are sold by count. The fewer shrimp you get per pound, the larger the shrimp are. There is no standard count, and there are no standard size descriptions. “Zipper backed” Shrimp means that the shells are slit at the back, but not removed, so that they will stay moist during cooking, yet peel easily at the table. Seawater shrimp are harvested from May to October; freshwater prawns are harvested in the fall. Unless you live near an area where shrimp are harvested so that fresh really means fresh, it could be that the fresh shrimp you see sitting on ice at the grocery store were actually frozen and thawed. Most of the shrimp harvest is frozen at sea on the ships. Ask if the shrimp is fresh, never frozen. Otherwise, overcome your natural inclination to think that the more expensive shrimp at the fish counter are any better than the bags in the freezer. In fact, the ones in the freezer may be better quality because they have remained frozen. Shrimp actually have a teeny tail at the very end of them. But in referring to a shrimp’s body, we refer the tail as being everything but the head, which you chop off before eating. Shrimp are greyish-green or greyish-blue when raw, and a pinky orange when cooked. Even raw shrimp / prawns sold as “fresh” at the fish counter will have been frozen at sea. When they are sold still frozen, their weight will be artificially inflated a bit by the ice crystals inside them. A 1 1/4 (550g) bag of frozen shrimp may weigh slightly less than a pound (400 to 450g) once thawed. If you are planning to grill, barbeque or cook shrimp in any way, don’t buy it already cooked as it will go all rubbery on you. If you want to use cooked shrimp in a warmed dish, arrange somehow to stir or add it in at the last minute, just enough to heat them without cooking them into rubber and wasting your expensive shrimp. Unfortunately, this doesn’t give the flavour a lot of time to permeate the dish. Uncooked shrimp are generally better to cook with, giving you the chance to have them absorb the flavours you want them to. Seawater shrimp generally comes deveined these days, but if yours didn’t, you’ll want to devein before cooking as it’s easier. Run the tip of a paring knife down the back of the shrimp, and then pull the vein out with your fingers (it’s actually not a vein, it’s the shrimp’s intestinal tract and the black is the excrement that was on its way out.) In smaller shrimp, you don’t need to do this, but in some larger shrimp (such as rock shrimp), the intestinal tract can hold gritty matter. Freshwater Prawns don’t generally need deveining, as the Prawns have been held in holding tanks with no food for 8 hours, allowing them time to purge all food out of their intestine. Some people like to use metal or plastic shrimp deveiners, which give you a finer, more flexible blade to work with. When broiling, grilling or barbequing them, you want to keep the shells on to keep the juices in. If you are working with freshwater Prawns, definitely leave the shells on — remember that they contain very little fat to keep them moist. If you’ve been handed the shrimp already shelled and are supposed to barbeque them, you’ll need to either marinate or baste them. When you fry shrimp, you generally want to shell them first. To shell the shrimp, first chop or pinch and twist the head off. Grip the feet, pull around to one side to break off the shell. Then, hold the actual tail at the end while holding the shell-free part of the body in the other hand, and pull sharply. The remaining shell should pull off. Do not overcook shrimp, or they just get rubbery. Jumbo shrimp will take about 7 minutes, large ones about 5 minutes; all smaller ones should only need about 3 minutes. If you have boiled your shrimp, don’t leave them in the cooking water when the time is up: get them out and dump them in cold water for a minute or two to stop them cooking any further. Sometimes some Chinese dishes have shrimp in them that is straight — that didn’t curl up when it was cooked, as it normally would. If you really want to replicate this effect, run thin skewers through the length of the cleaned, peeled shrimp before cooking, and then remove the skewers before serving. Try to avoid cooking with the frozen bags of small shrimps if you can. They are really waterlogged and can make whatever you are cooking soggy (which is fine, however, if you are doing a soup or a chowder), and almost always end up chewy and tough unless you add them at the very last minute, which doesn’t do much for getting the shrimp flavour throughout your dish. Crawfish tails, lobster, scallops, tuna chunks. If you buy shrimp whole, remove the heads as soon as you can so that the fluids in the head don’t drain into the tail, making it mushy. You can discard the heads, or, better yet, use them to make a gorgeous shrimp stock with. Shrimp should be frozen headless, and if you are going to freeze them, freeze them on the same day that you brought them home. Don’t refreeze “fresh” Shrimp that might actually have been previously frozen. Defrost frozen shrimp overnight in refrigerator, or in cold water. Microwaving defrosting will dry them out. 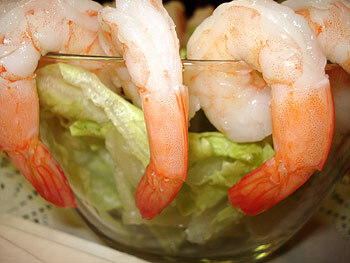 When thawed, raw shrimp will keep two days in refrigerator. The Roman food writer, Apicius, lists a recipe for shrimp (Scillas) in his cookbook, “de re Coquinaria”. The Roman word, “Scillas”, means “big shrimp”. In Middle English, “schrimpe” meant a very small person. “Gamberetti” in Italian is the small, salad-sized shrimp, like the ones that come packed in small tins. In the North American mind, Australians are always saying, “No worries, mate, I’ll throw another shrimp on the barbie…” That’s actually the last way an Australian would cook shimp, though. In Australian, a “shrimp” is one of those teeny little salad shrimps that come in tins. You can throw as many of those as you like “on the barbie”, but they’d all just fall down through the grates into an instantly-incinerated mound. Australians would actually use the word “prawn”, indicating to them what North Americans would call a “medium-sized shrimp”. That being said, the line is actually “I’ll slip an extra shrimp on the barbie for you,” as said by Paul Hogan on a television commercial that ran in North American for the Australian Tourism Commission. Most North Americans have no idea what the word “prawn” means, and given some of the outback food seen in National Geographic documentaries, the Australian Tourism Commission just wanted to be really clear about what potential tourists were being invited to gnosh on. The Popularity Issue. Business Week Magazine. 15 August 2010.